Part of the Les Essentiels de Chanel makeup collection for fall 2012 that got a really early release some time last week, Suspicious is a deep raspberry reddish pink that is the perfect bright color to give that pop for a dull, dreary autumn day but works just as well as the perfect bright summer manicure. A creamy polish, this goes on opaque and nonstreaky with just one coat, but a second coat helps give it a more polished look (at least with my clumsy oaf application!). I suppose this isn't the most unique shade out there, but I really love how it manages to work with my skin tones and actually is a pinkish red that I see myself using a lot. 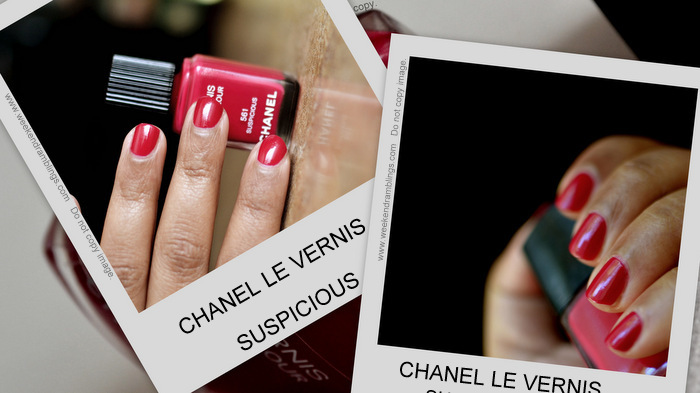 For comparisons with similar shades from the Chanel line up, check Sabrina's post on The Beauty Look Book. clumsy oaf application! - will spank you for saying this Rads.. It is a pretty berry colors.. looks lovely on your nails..